From an abandoned quarry to the 1929 headquarters of Shanghai Power Company, Shanghai offers two especially unique stays this winter, with their soon-to-open five-star properties. IHG has already announced the pre-opening of the InterContinental Shanghai Wonderland, scheduled to open doors by the close of this year. Developed by Shimao Group, one of the largest construction companies in China, the hotel is carved into the edge of an abandoned 88-metre deep quarry in southwestern Shanghai. The 18-storey hotel has two floors above ground, and 16 below ground, including two floors underwater. With a construction area of more than 61,000 sqm, the hotel features 336 rooms and suites that all boast balconies where guests can enjoy a spectacular view of waterfalls from the surrounding cliffs. 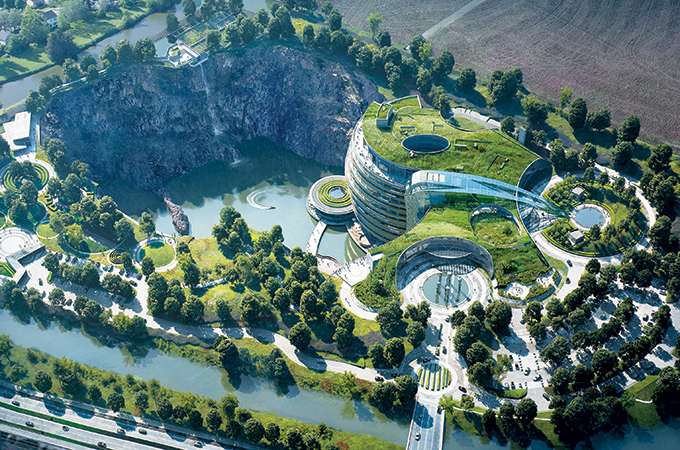 In contrast to the traditional architectural concept of building high-rises, InterContinental Shanghai Wonderland adopts an unconventional design of extending space beneath ground by truly reflecting the natural landscape of the quarry. Set to launch later this month, The Shanghai Edition comprises a refurbishment of one of the city’s finest buildings – the art-deco former headquarters of Shanghai Power Company on Nanjing Road, built in 1929. The historic building is home to the public areas and amenities of the hotel restaurants, bars, rooftops, spa and meeting and events areas. The Power Building has been fused to a new skyscraper, which houses the 145 guest rooms of the hotel, creating a multi-dimensional old-to-new space. Restaurants, bars, and entertainment include: Shanghai Tavern, Michelin Starred Chef Jason Atherton’s all-day dining, brasserie style restaurant and HIYA, a new Japanese restaurant, also by Atherton; Punch Room, the sophisticated cocktail lounge first made famous at The London EDITION; Canton Disco, a traditional Cantonese restaurant concept, with a contemporary update; The Club Room – a gentleman’s club-inspired lounge area that exudes a sense of warmth and exclusivity; and Electric Circus, a fresh kind of club and VIP lounge and nightclub, in the tradition of Ian Schrager’s first venture, Studio 54. Other communal spaces include a series of modular meeting and event floors, a fully landscaped tropical Roof Garden and one of few urban green spaces in Shanghai, equipped with a bar and cinema; the Urban Lobby, the threshold that connects the heritage building and the postmodern tower, a swimming pool sunk in stone and overlooking the urban landscape; a gym, spa, and multiple terraces.